You can view and download data extracted from the Rijksmuseum collections on a Google spreadsheet I’ve published. Over the next week I will be publishing a series of posts summarizing my very initial exploration of these data, with some reflections on future work as well as potential implications for art historical study and the creation and dissemination of cultural data. The art historian Henri van de Waal began to develop Iconclass in the early 1950s to provide “a systematic overview of subjects, themes, and motifs in Western art,” with a particular emphasis on systematic. An Iconclass notation comprises a string of digits and characters (with possible additional tags or attributes) meant to accurately and authoritatively classify iconography in European art. Laborious linear sifting of the literature, transcribing the information on index cards and ultimately publishing the result in book form should give way to computer processing, which would lend much broader scope to documenting both the literature and the pictorial material itself. The resulting bibliography would remain “open” and up-to-date, give access to all the literature encompassed – and to artists’ names, technical data, indeed, everything fed into the program. Print-outs could be made available at any time, both the complete store and any special subject desired. Most importantly, questions and answers would no longer have to be linear. Let us take as an example a question about “broken jugs” (33C4211) – what has been written on this theme? Alternatively, the question might be where the theme of the “broken jug” may be found depicted, as well as where it occurs in primary and secondary sources. … If there were an appropriate computer program and store, the question could be much more specific – where would one find “broken jugs” in 18th century French art, and are there any reference? What about the 17th-century Netherlands? Does the “broken” jug theme occur in pottery? In the school of Rembrandt? 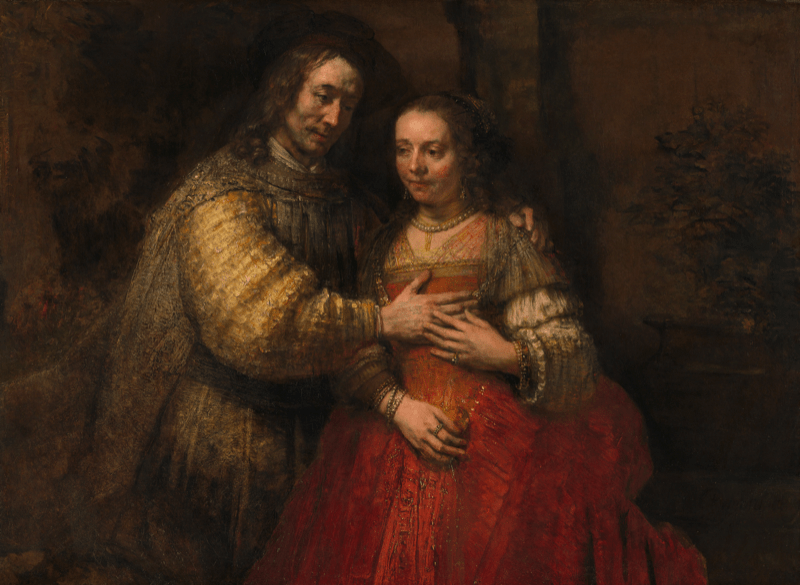 Rembrandt van Rijn, Portrait of a Couple as Isaac and Rebekah, c. 1664-1669, Rijksmuseum, Amsterdam. This built-in hierarchy allows a kind of “fuzzy search” for related images. From an image of Isaac and Rebekah, I could also find images of other Genesis stories, or of the Old Testament even more generally, or of the Bible more generally still. While Becker’s questions remain important, they can essentially be resolved by performing individual lookups on an image database categorized according to Iconclass. While this process may certainly be aided by computers, it is nothing that a persistent scholar couldn’t do with printed indexes and a good pencil and notebook (not to mention hermetic focus and patience.) Yet the contributions of computerized records and indexes need not be limited to speeding regular queries. They offer entirely new paradigms for using this data. In the past year, the Rijksmusem in Amsterdam has opened not only their images, but all the associated data of more than 100,000 objects from their collection, for open download and manipulation. This publication of a vast trove of structured, computer-readable information allows us to ask questions that Becker did not consider in the 70s. We have the capacity to do large-scale analysis of all of this data at once. By essentially counting paintings, rather than trying to look closely at each and every one them, can we visualize decades- or centuries-long trends in art history? This was a question I’ve been grappling with this entire summer, and I’ve got some preliminary thoughts to share. After downloading the Rijksmuseum data using their API, I tidied it up somewhat, discarding records that were missing either a date or an Iconclass notation. About three quarters of their objects have both these fields, providing a robust sample of a little over 75,000 records to query. Artworks per year from the Rijksmuseum’s online collection. But what about those Iconclass notations? The ratio of artworks with subject mattered labeled as “Bible” to all total artworks from that year; plotted with a 20-year moving average of the same. Stacked line graph of the 20-year moving average of ratios of each top-level Iconclass subject to total artworks. How some of these appearances may be deceiving I’ll get to in the next post, but for now, note the upheaval of subject ratios during the sixteenth century. The ratio of artworks featuring “Bible” subjects, strong at the start of the 1500s, drops sharply over the first quarter of the century to recover somewhat around 1550, only to then diminish gradually through 1600 onward. Artworks with “Religion and Magic” subjects also see a similar drop at the start of the 1500s, but their second rise comes later in the century, before joining “Bible” subjects in a mostly steady decline through the seventeenth century. What seems to fill the gap? The ratio of artworks with “Nature” or “Society, Civilization” subjects. These categories come to dominate Rijksmuseum art of the seventeenth century, and much that follows, too. Are any early modernists nodding along now? The sharp rise in these “secular” subjects in the early decades of the seventeenth century, coupled with the decline (but not disappearance) of sacred artwork, seems to correspond to the general narrative in Dutch art history of the rise of landscapes, still-lifes, city views, and domestic scenes independent of explicit religious iconography that come in an officially-Protestant nation in which investors and merchants, rather than the Church and its religious orders, dominate the art market. The peculiar trends in that religious iconography in the sixteenth century, on the other hand, suggest at least some connection to both the surging Protestant Reformation at the start of the century, and the Catholic Counter-Reformation that coalesced fifty-odd years later. This quick and dirty visualization masks quite a bit of the real complexities described by the Rijksmuseum data. In my next posts, I’ll dig further into these data to try and better grasp the underlying complexities of the subject trends that seem to present themselves in these sixteenth century. I’ll also be addressing the myriad problems with these data and assumptions driving my analysis; assumptions that have a lot to do not only with quantitative problems, but also with enduring art historical questions. This blog is a place where users of Iconclass, the classification system for subjects in the arts, can share news, stories and opinions about their work and Iconclass related projects. We also repost writings about iconclass from other sources (when permitted). Iconclass and RKD do not necessarily endorse the views expressed here.